Both beginners and experienced performers can find a place in Lakeside’s drama and technical theater program, where faculty place an emphasis on personal growth through taking creative risks. In classes and in productions, students engage in a feedback-driven process where they learn the importance of experimentation, play, and attention to detail. Our faculty consists of inspiring, expert teachers with deep connections to the Seattle arts community. In addition to theater-specific skills and knowledge, students learn life skills in public speaking, interpersonal communication, creative problem-solving, and collaboration, as well as develop social-emotional skills such as empathy, focus, and resilience. In the process, students gain a greater knowledge of themselves, and develop deep relationships with friends and teachers that often continue long after they graduate. Drama courses at the Middle School are active, thoughtful, and fun. Students are introduced to a wide variety of theatrical forms and experiences, including multiple types of acting (improvisation, solo performance, Shakespeare, and sketch comedy); design for sets, costumes, props, lighting, and sound; playwriting; and directing. Students are taught to reflect on the qualities of good storytelling, and how stories evolve as they move from a script to a staged production – as well as the important role of a careful observer in giving constructive feedback. The faculty creates a safe classroom space where students can take creative risks, and engage in questions about art, identity, and expression. Starting in 6th grade, Middle School students choose which performing art they would like to study each year. Sixth-graders can choose between a beginning band, a combined drama/choir class, and orchestra. In grades 7 and 8, students choose between yearlong classes in band, choir, drama, and orchestra. Performing arts classes take place four times a week, which gives students a meaningful amount of time to learn and develop new skills. In addition to regular performances related to classwork, the Middle School drama program offers co-curricular productions for which rehearsals take place outside of school hours. Learn more about Middle School drama in our Middle School curriculum guide. Lakeside’s Upper School drama program is a welcoming community, where students can connect with others who share their love and passion for performance. We offer four yearlong courses in drama, and students can enter the program in either Drama I or Drama II. Students study acting – including ensemble and solo work, movement and stage combat, dance, and improvisation – playwriting, directing, and dramaturgy (research). Advanced courses include a focus on Shakespeare, character mask and clowning techniques, and participation in ACT Theatre’s Young Playwrights Program (YPP). The program also offers four years of theater production, in which students learn to apply a design process to a range of performance projects, from sketching out early design concepts to building sets, creating costumes, lighting and sound design, and special effects. 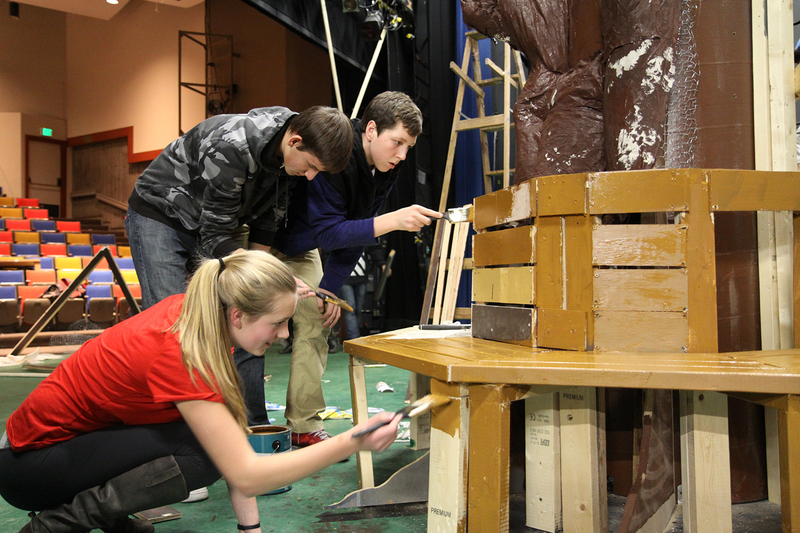 The Upper School drama program stages five productions each year. Students participating in drama can choose to play a role on stage as actors, or behind the scenes, as directors, producers, and stage and lighting crew. Productions include a musical, and an evening of one-act plays performed, directed, and often written by Lakeside students. At least two of the five productions have open auditions, meaning that any student – not just those taking a drama class – can try out. The program prepares students to participate in drama at the college level, and Lakeside students have gone on to have professional careers in the arts. All students will gain a deeper understanding of theater which supports a lifelong appreciation for the art form. Learn more about Upper School drama and technical theater in our Upper School curriculum guide.